The new Fortis Blue Horizon Chronograph is a robust pilot watch that the Grenchen-based watchmaker will make available in a limited edition of 135 pieces worldwide. The 42mm brushed steel case protects the Swiss automatic ETA Valjoux 7750 movement with 25 jewels, 28,800 vibrations per hour and a power reserve of 40 hours. The movement is visible through the display back. The blue contrast elements on the brown sunday dial add a distinctive touch to this professional instrument. The dial is completed by the typical Fortis aviation hands and raised Arabic numerals and indices. Hands, indices and the two dots at 12 o'clock are coated with blue Super-LumiNova, green afterglow. 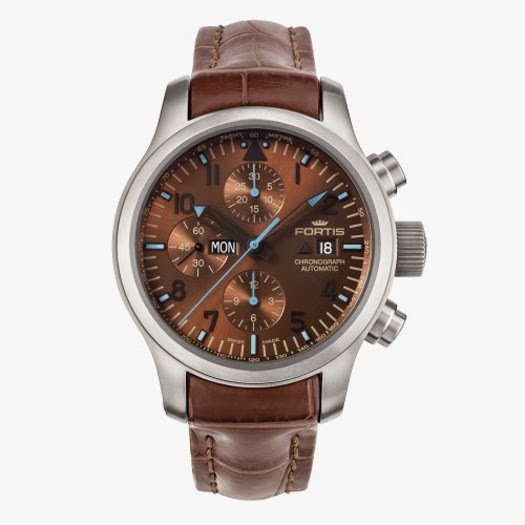 The Fortis Blue Horizon Chronograph is water resistant to 200 metres and is matched to a cognac brown leather strap. It is also possible to opt for a rubber strap or a steel bracelet. Retail price is about Euro 3,000. 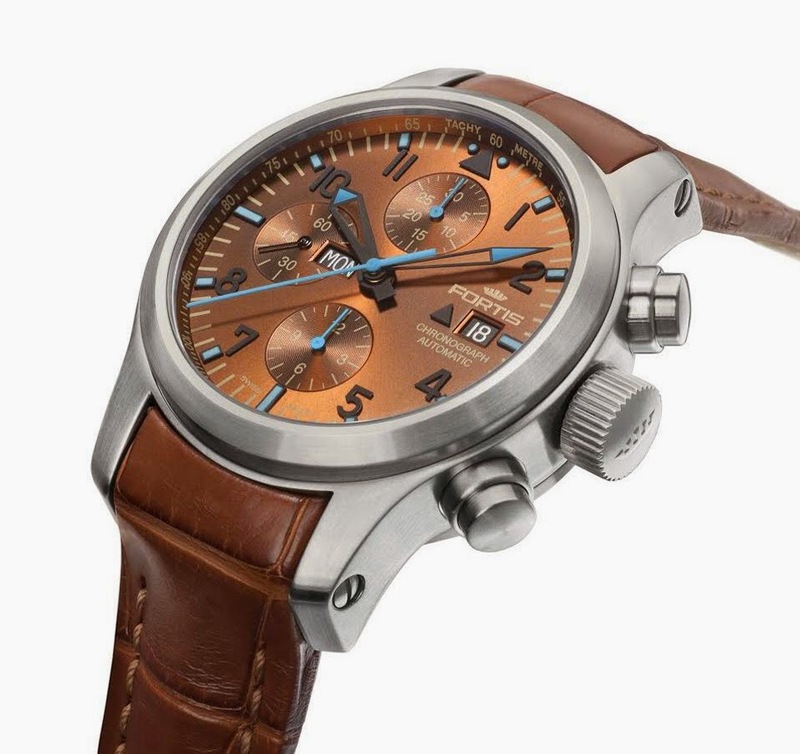 With the same features and movement, Fortis also released the Aeromaster Dawn Chronograph which differs from the Blue Horizon version for the red and beige elements contrasting the brown sunray dial. The Fortis Aeromaster Dawn Chronograph is not a limited edition and has a retail price of about Euro 2,800. 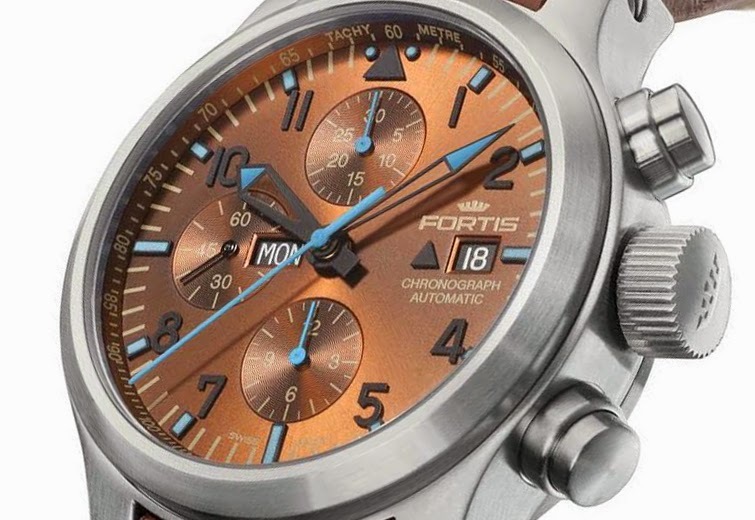 Fortis Blue Horizon Chronograph. The new Fortis Blue Horizon Chronograph is a robust pilot watch that the Grenchen-based watchmaker will make available in a limited edition of 135 pieces worldwide. The blue contrast elements on the brown sunday dial add a distinctive touch to this professional instrument. 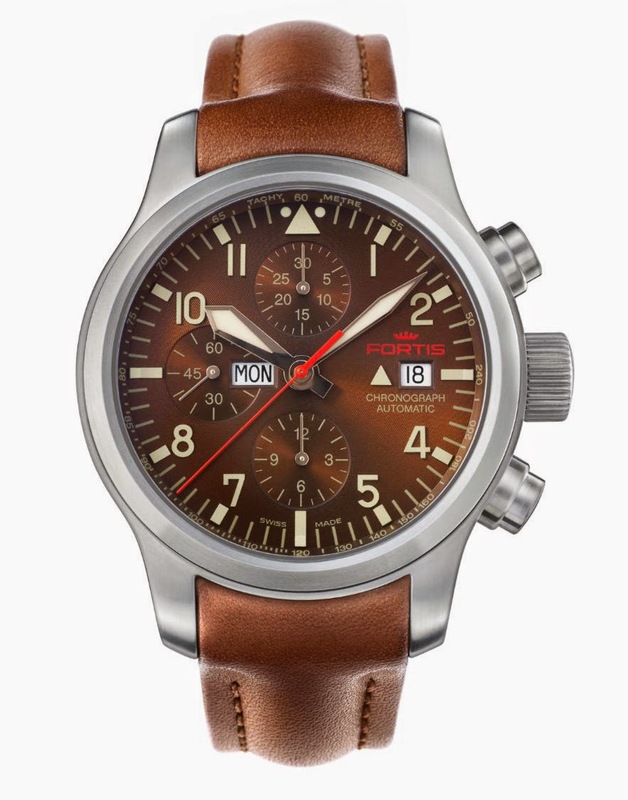 Fortis also released the Aeromaster Dawn Chronograph with red and beige elements contrasting the brown sunray dial. The Fortis Aeromaster Dawn Chronograph is not a limited edition and has a retail price of about Euro 2,800.